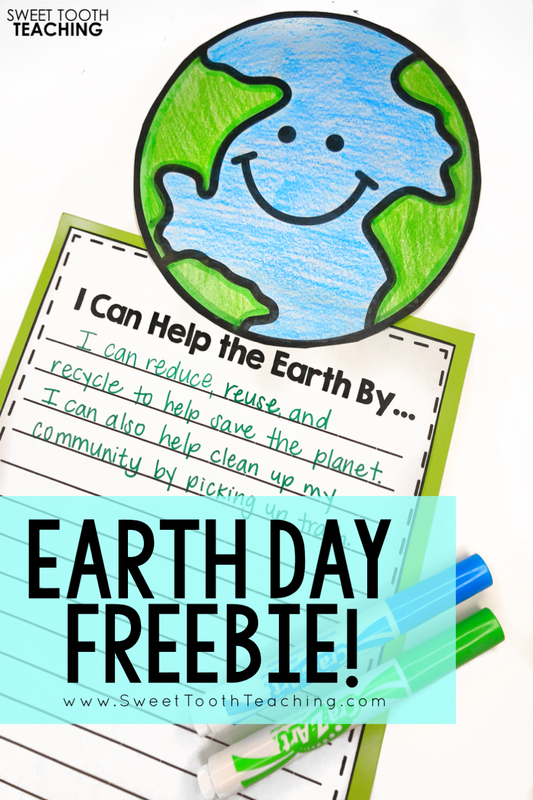 It's Earth Day Month! 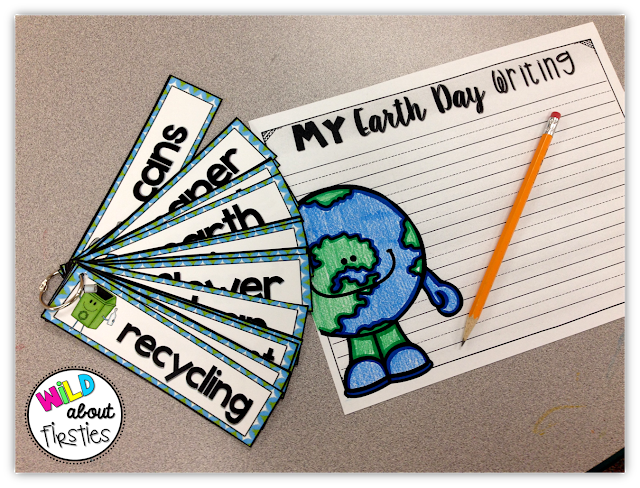 Earth day is one of my FAVORITE days to celebrate with my kiddos. I am a huge nature lover and try to do the best I can to take care of our planet. As teachers, we play a big role in teaching the importance of taking care of this beautiful place. Our kiddos are the ones that are going to stay here long after we're gone, right? 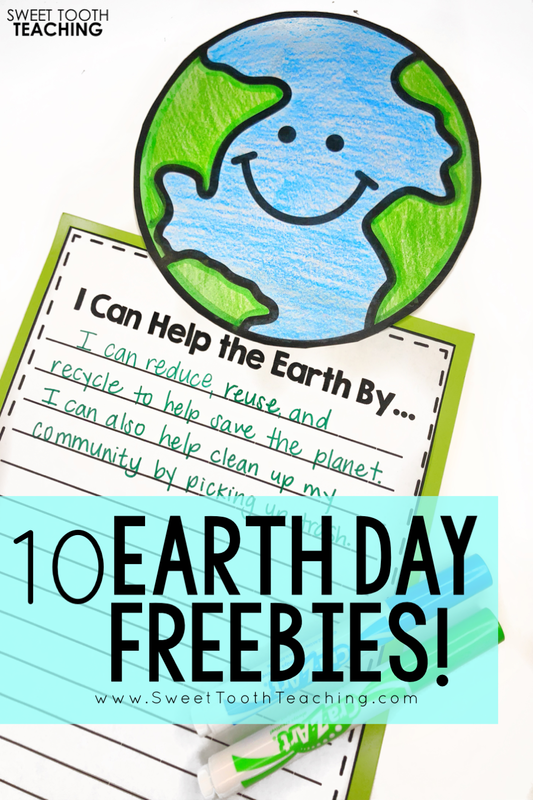 I'm sharing 10 Earth Day FREEBIES you can use with your kiddos throughout the month of April. 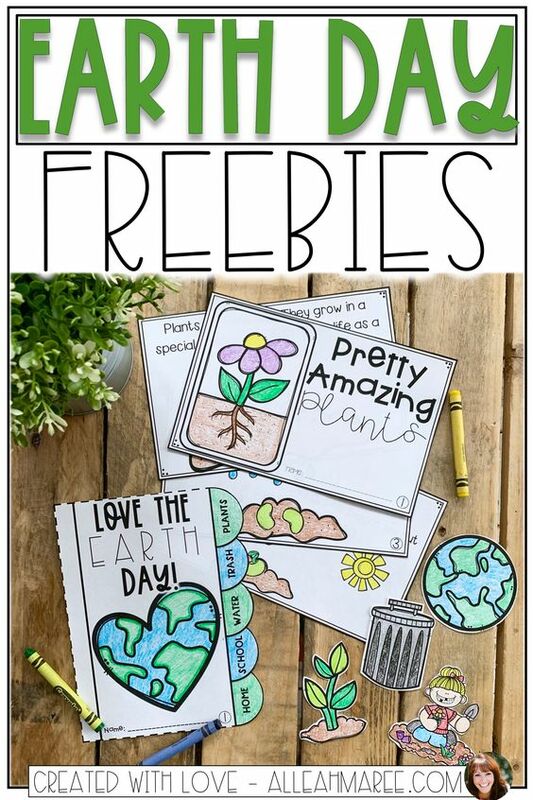 In this freebie, you'll find a bunch of fun activities for your little students to learn about plants, how they grow, and the Earth! 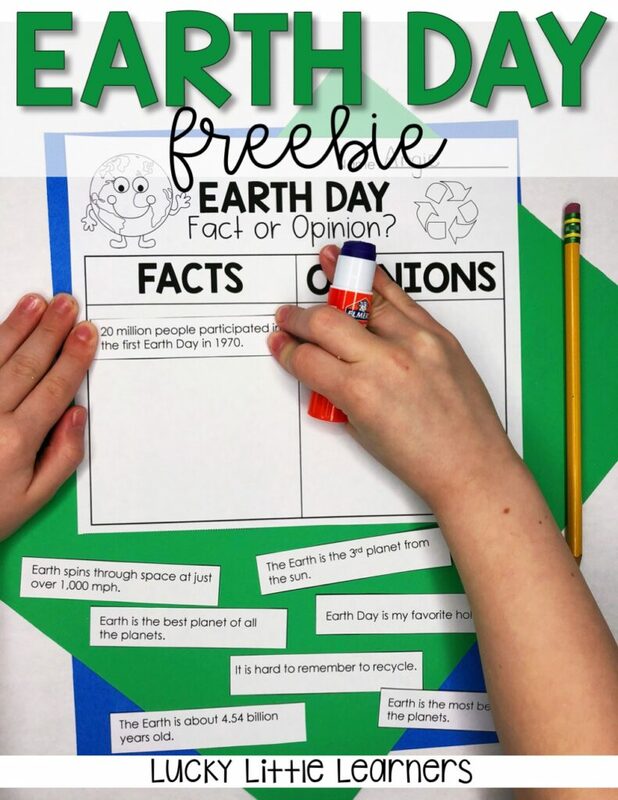 Learn all about Earth Day by sorting facts and opinions about our planet. 3. 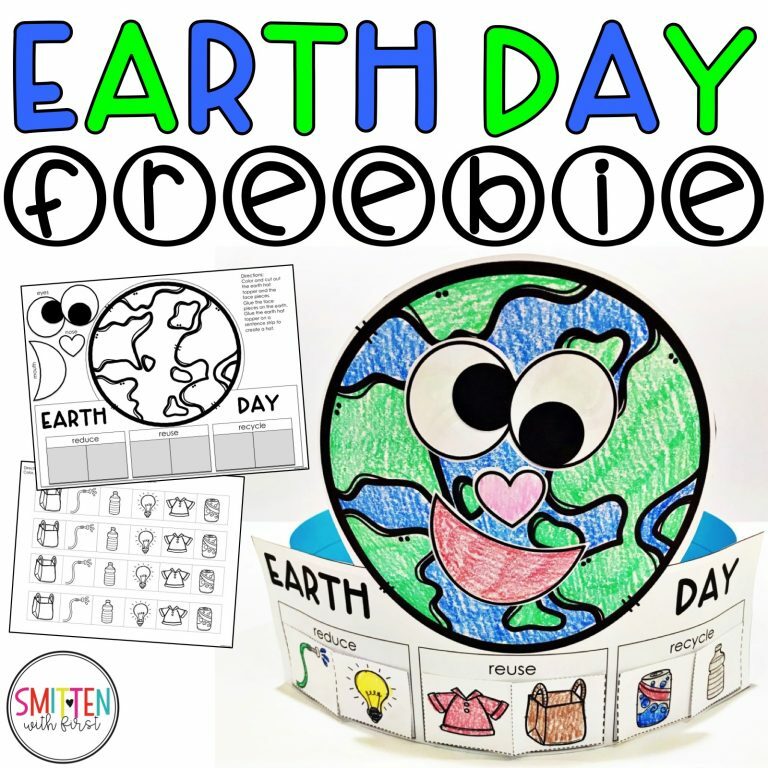 Earth Day Necklace by The Crafty Classroom Send your kiddos home with an important Earth Day message to share with their parents! 4. 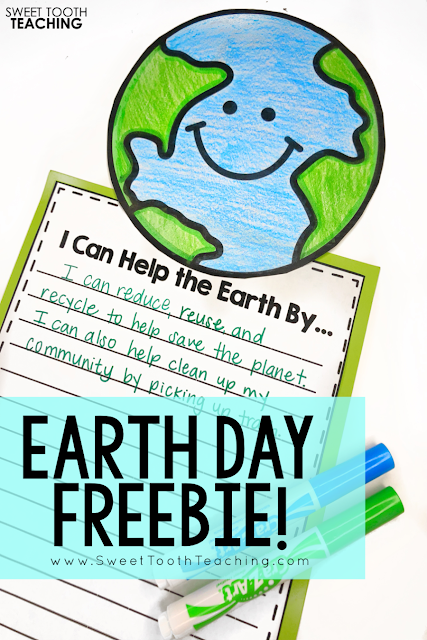 Happy Earth Vs. 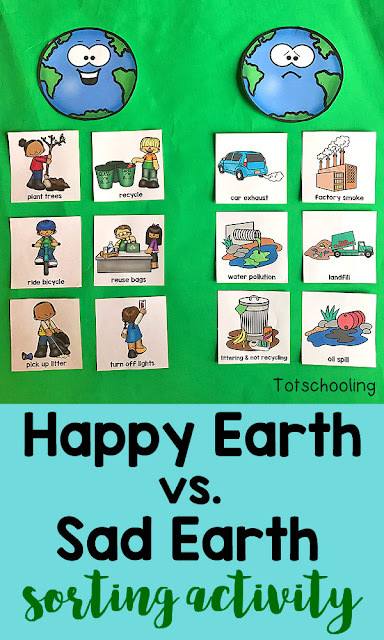 Sad Earth Sorting by Tot Schooling Have your kiddos work in groups to sort out good and bad choices. 5. 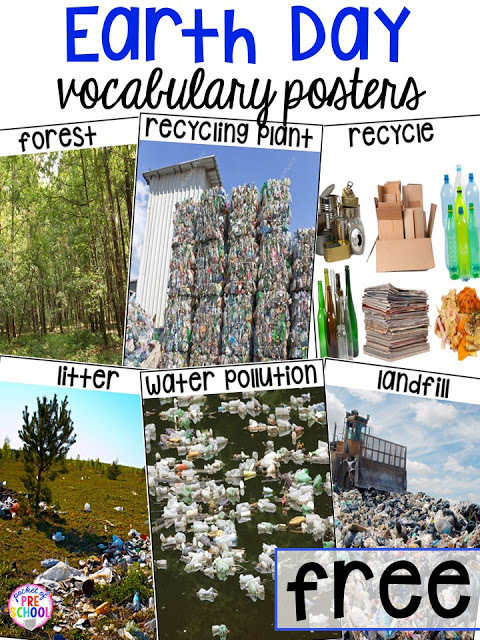 Earth Day Vocabulary Posters by Pocket of Preschool Display these all week long for reference! 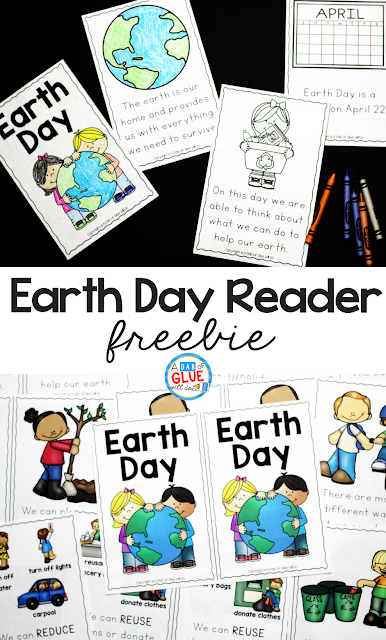 Have your kiddos sort our different Earth Day scenarios based on the three R's. 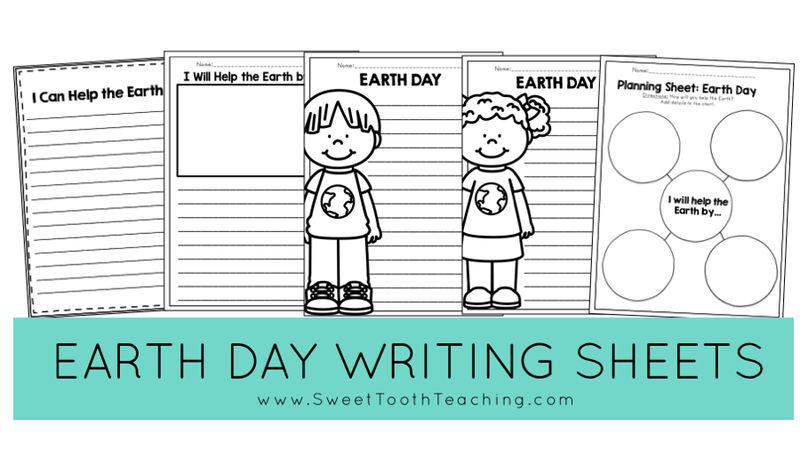 Help your kiddos learn more about Earth Day with this nonfiction reader. 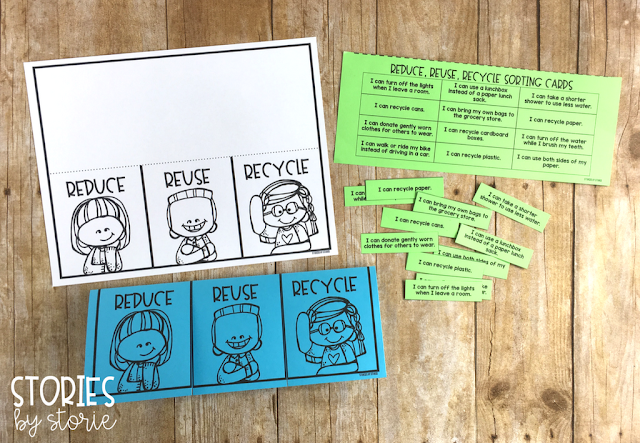 This cut & paste lesson on reducing, reusing, and recycling is turned into an adorable craft that kiddos can take home! Use these writing cards during centers to help your kiddos build sentences or to incorporate them in their paragraph writing. Earth Day writing and planning sheets will help your kiddos transfer everything they've learned onto paper! Also includes Earth craft to attach to their writing piece. 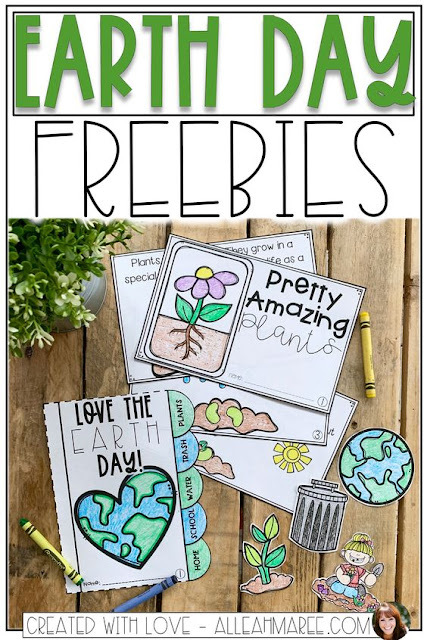 I hope you found these 10 freebies helpful! Testing season is here! Everyone's favorite time of the year--- said no one ever! Actually, I do kind of enjoy the prepping that goes along with testing season. Okay, hear me out before you think I am absolutely out of my mind. 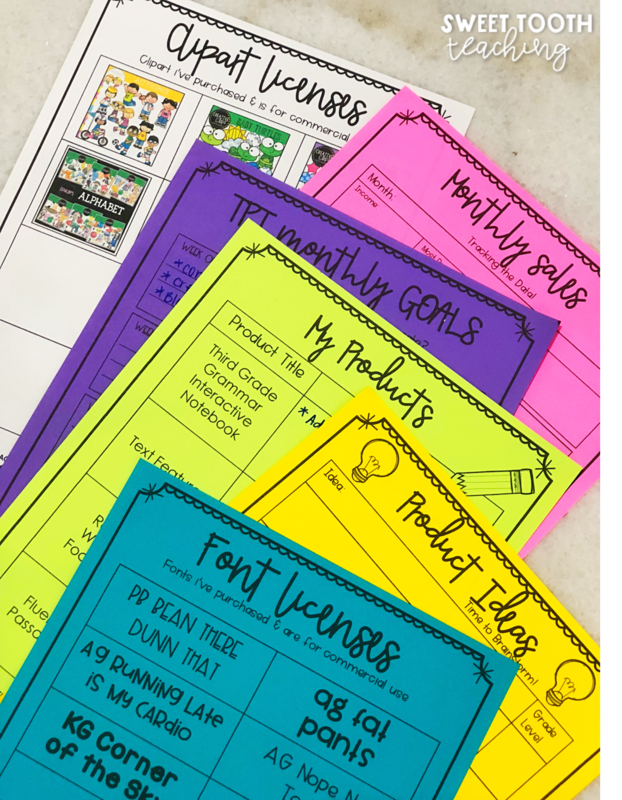 I love creating review lessons and activities that are engaging for my kiddos. Testing season is the best time to put all of those skills we've learned throughout the year together and create a meaningful transformation for the babes! 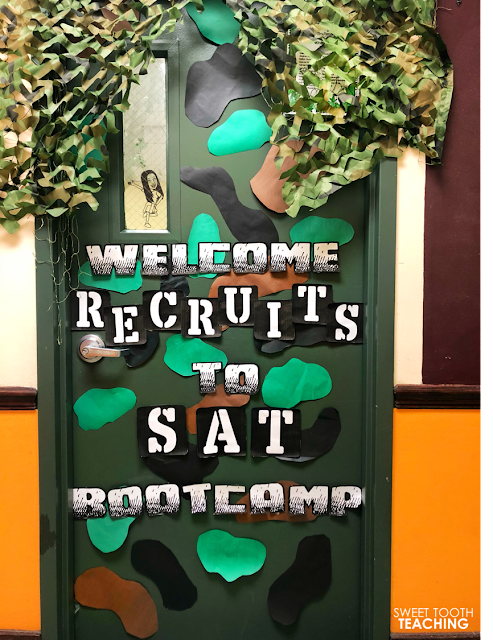 For the last two years, I've hosted a testing bootcamp the week right before state testing. Ya'll, IT IS A HIT. 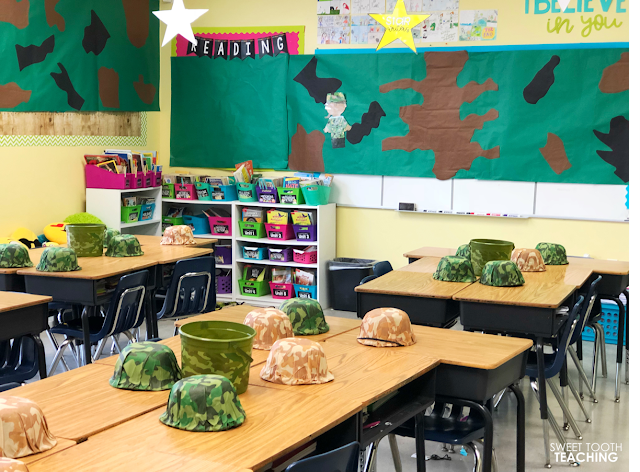 We transform our classroom into a military camp. Since our walls have to be covered for testing purposes, it works out perfectly! I cover the walls with 'military themed paper'--- AKA butcher paper. Nothing Fancy. This post contains affiliated links, meaning, if you click through and make a purchase, I may make a commission. This is at no additional cost to you. Click here to see all my other favorites! Each student is given a bootcamp 'Mission Folder' and badge for the week. They place any completed assignments inside their folder. Templates are from Katie Meyer on TPT. I create 'Missions' for each week. 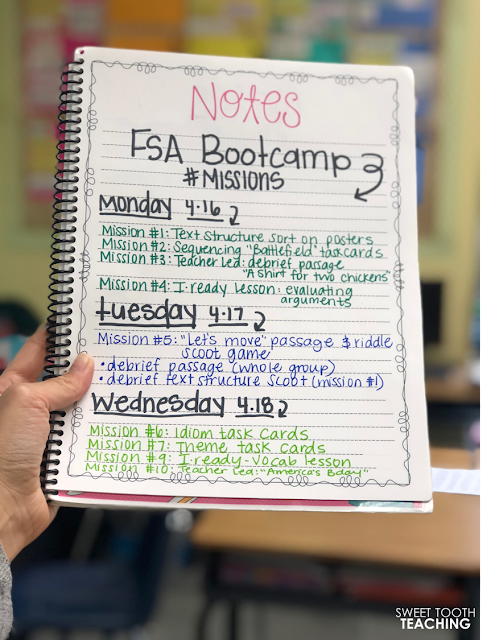 Each mission focuses on a specific skill or strategy that we have already learned throughout the school year. Each mission consists of some kind of hands-on activity. For example, Mission one might be a text structure sort. Mission two is answering sequencing task cards scattered across the room. I divide each day of the week into four missions. The students are divided into four groups as well. They are each assigned a mission to begin with. 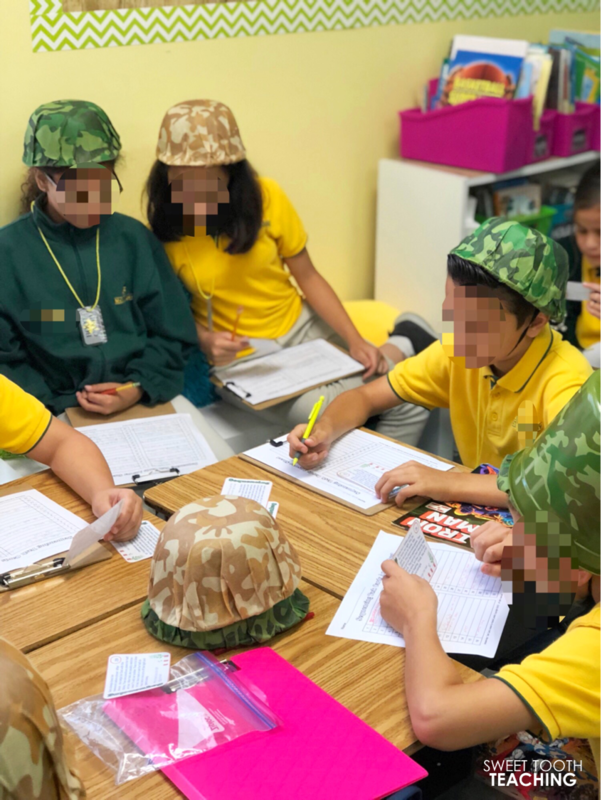 Once they have completed that mission and i've checked their work, they will earn a star for their badge and are able to move on to the next mission. (The 'star' is really just a star sticker, but oh man do they get excited about that sticker! Yes, even fourth graders get excited about stickers.) 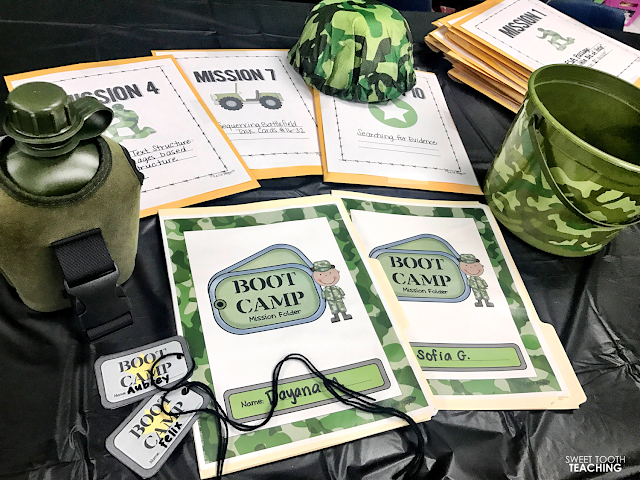 Pretty much: We did literacy centers, but I added a fun 'bootcamp' twist to it. Some days might not consist of four missions or groups. In the image above you will see that Day 2 was focused on just whole-group missions. However, they were still rewarded for their completion. You do NOT have to go out of your way to create something extremely over the top for each mission. Remember, you will be prepping a lot of activities ahead of time so you don't want to overwhelm yourself. I just tried to add a little 'flair' to each activity so that it was a bit more hands-on than a plain-old worksheet. 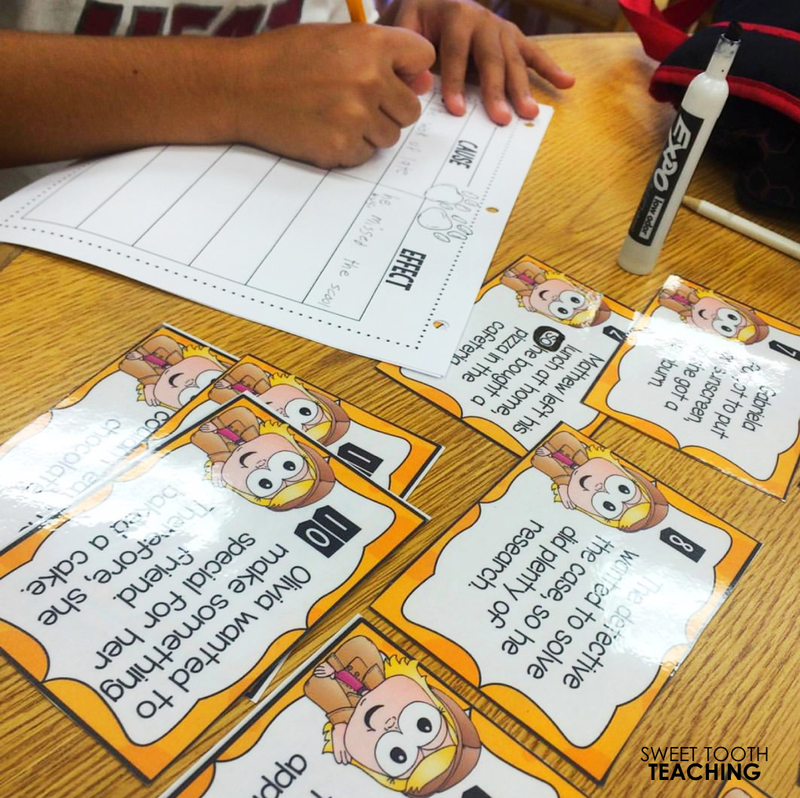 I used these text structure task cards from Rachel Lynett on TPT and created these charts with the text structures written on them. 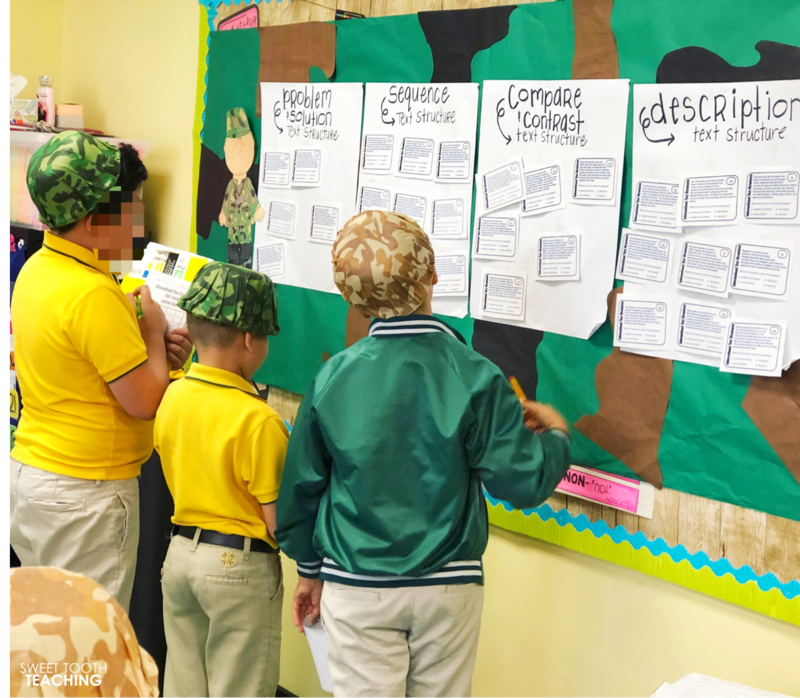 Instead of just having the kiddos choose the multiple choice answer, they used tape to sort the passages based on their text structure. 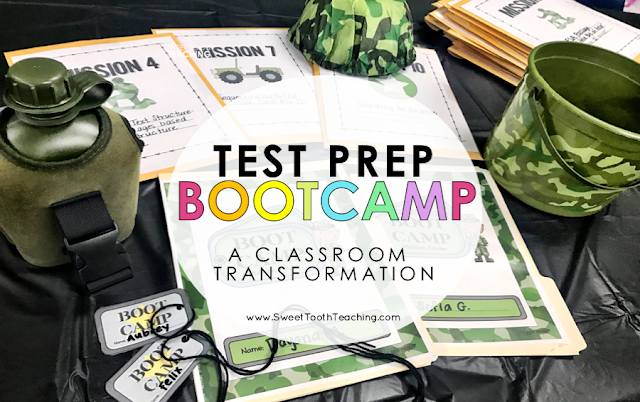 Testing bootcamp is definitely a fun and easy way to review with your kiddos right before state testing! 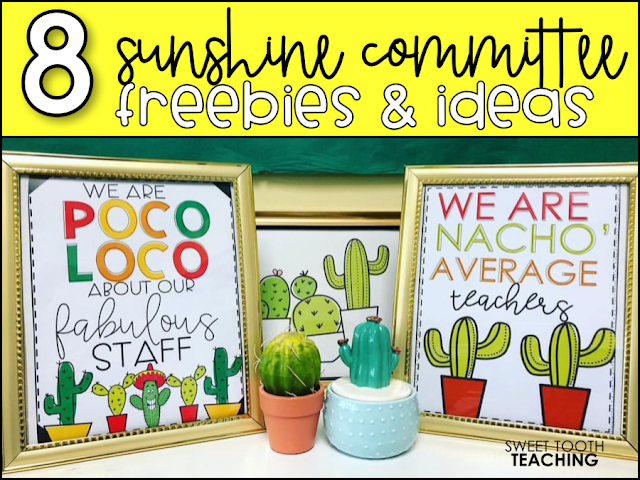 Do you have a sunshine committee (or events committee) at your school? If you don't, you need to hop on that train, ASAP! 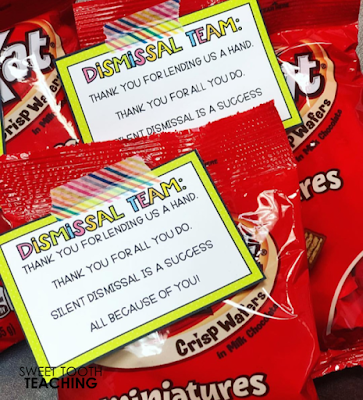 As part of the Sunshine Committee and admin team, we try to make our teachers and staff feel appreciated whenever we can. I used to work at a school filled with negative vibes. (I know we've all dealt with a Debbie Downer teacher.) Honestly, i'm a huge believer that your vibe attracts your tribe! Our Sunshine Committee and the uplifting environment in our school has had the power to transform many non-believers. 😉 Sometimes it's just the little things that can completely change the vibe at your school. Stuck at a difficult school with a difficult staff? Maybe all it takes is YOU to make the difference and influence those around you! 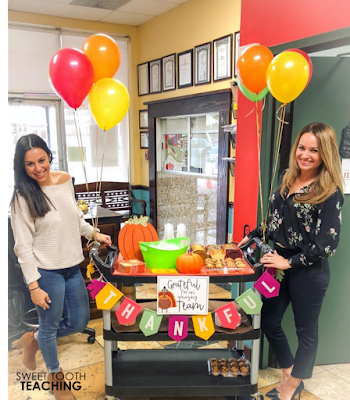 We walk around the hallways with our cart to distribute treats and smiles to our staff. Sometimes it can be as a simple as offering some afternoon coffee. So if you're looking into creating a Sunshine Committee at your school, i'll share some treat ideas that we've done for our team. 1. Welcome goody bags filled with donut holes. 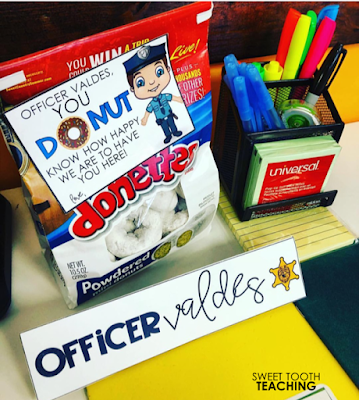 Download the Donut Tag FREEBIE here. 2. Welcome treat for our SRO officer. 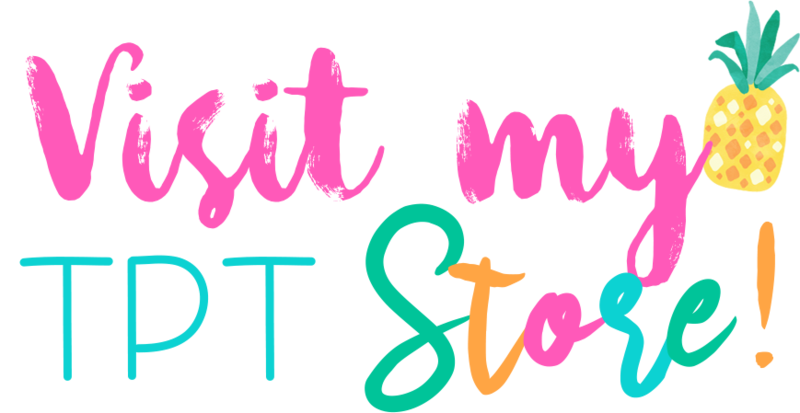 Download the SRO Tag FREEBIE here. 3. Teacher Appreciation treat! 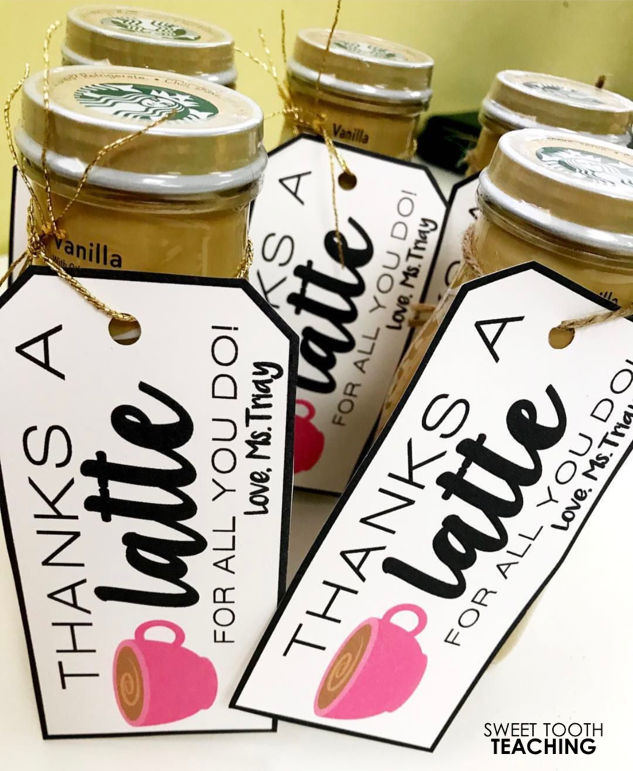 Download the Latte Tag FREEBIE here. Download the dismissal team tags FREEBIE here. 5. 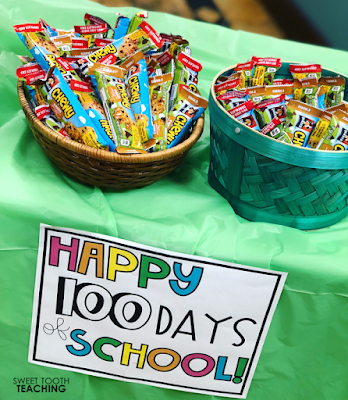 100 calorie snack bars for the 100th day of school! 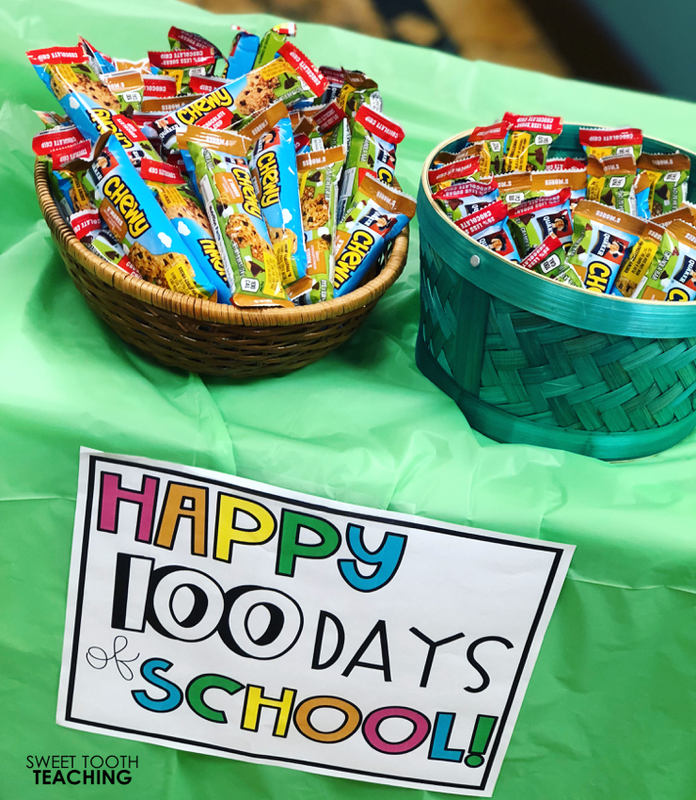 Download the 100 day sign FREEBIE from Sanders in Second here. 6. Halloween treats and beverages. Download the Halloween tag FREEBIE from Crazy Speech World here. 7. Thanksgiving sweets! Download the Thanksgiving tag FREEBIE here. Download the Cinco de Mayo tag FREEBIE here. 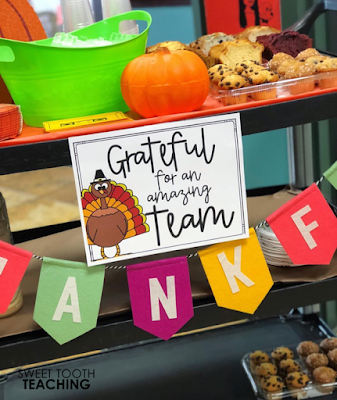 I hope your Sunshine Committee brings lots of joy and positivity to your school! Don't forget to tag me (@sweettoothteaching) in your sunshine committee photos! I use a piece of velcro to move the groups around the centers. Next up-- decide how often your groups will rotate and what kind of DI plan you want to put in place. In my case, I usually see one to two groups a day. Some teachers choose to see three groups and just spend 15 minutes with each group. I rather see less groups and spend more time with each one. 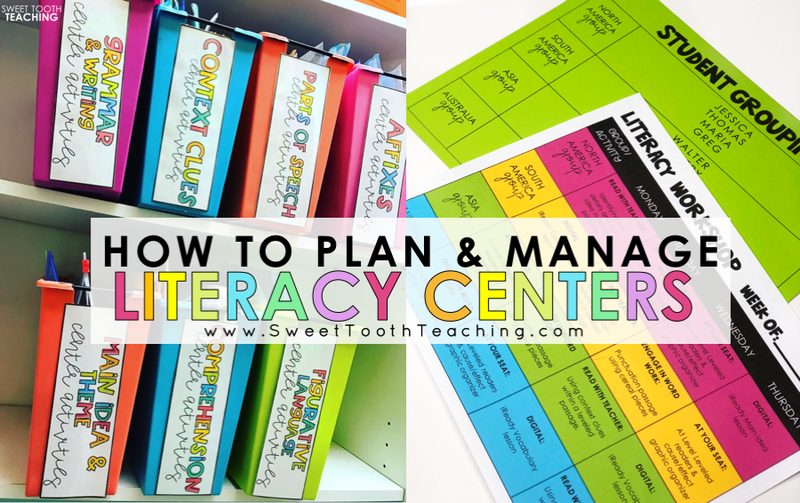 My literacy centers are: reading comprehension, teacher-led, word work, and technology. 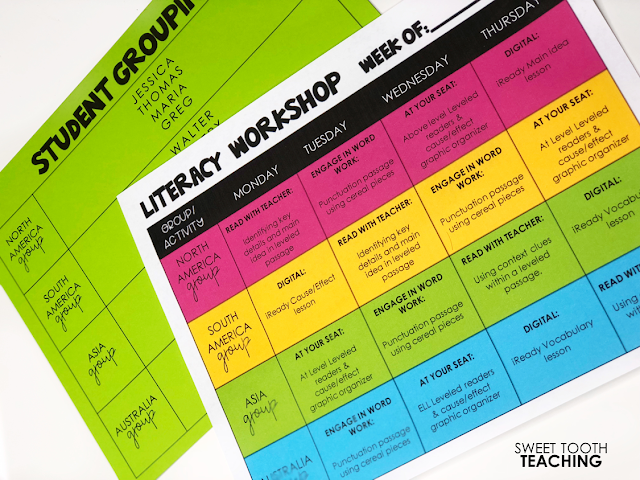 You can grab this template along with the Literacy Workshop board in my TPT store. I use this template on the weeks that i've decided to do two rotations. DOWNLOAD this template for FREE here! 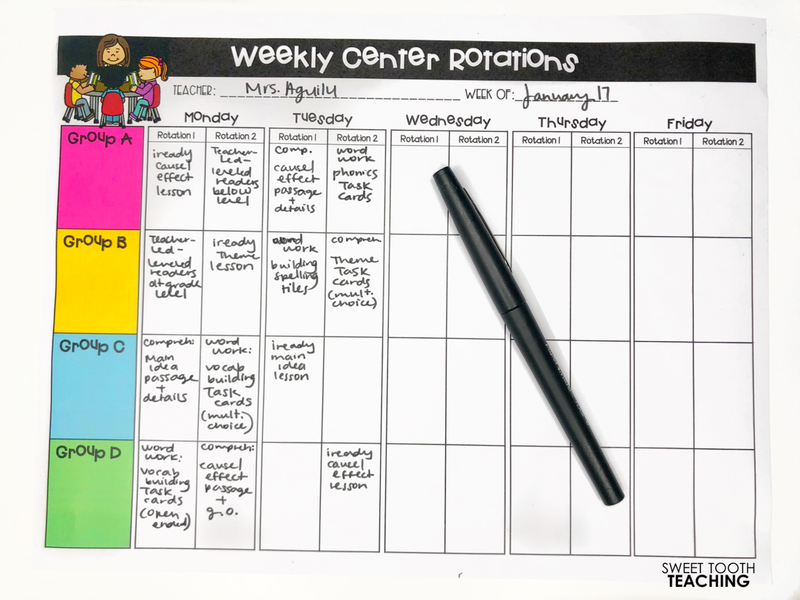 I have SO many center games, task cards, and resources that i've gathered over the years! 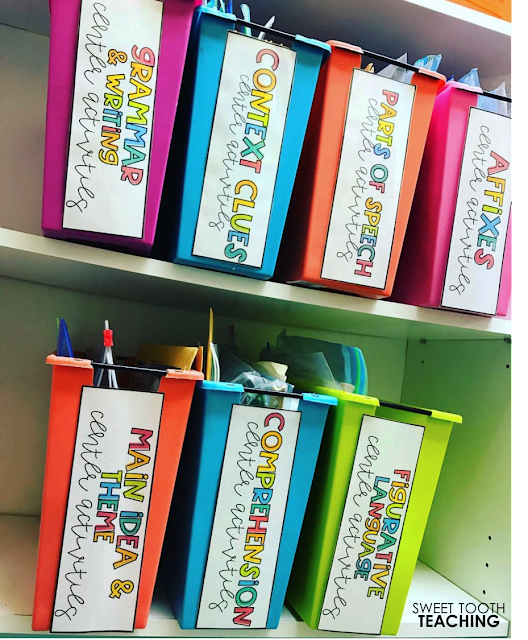 (The majority of them are from TPT or hand-made resources) They're organized in bins and ziplock bags for easy access! My DI plans are created based on specific needs I see in my class or skills we're working on. For example, if a group of kiddos bombed a cause/effect test the previous week, we'll focus on cause & effect in our teacher-led center the next week. If we're working on punctuation during whole-group instruction, i'll create a punctuation activity for our word work center. I usually assign a group 'leader' for the month. This person is in charge of making sure everyone understands the activity and is on task. 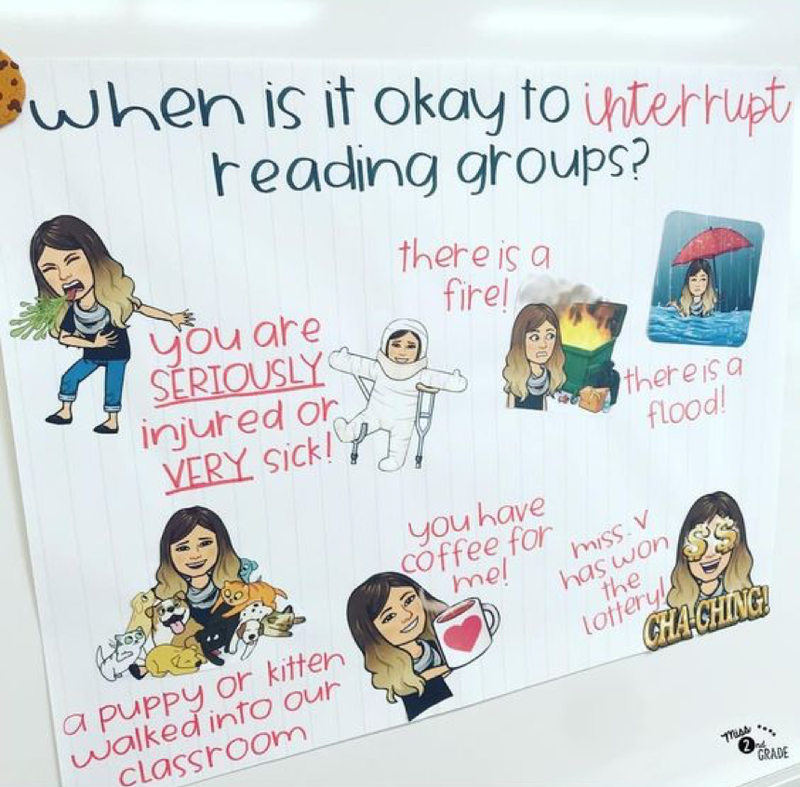 The kiddos know they are not allowed to come interrupt my teacher-led center unless their head is on fire. Literally. 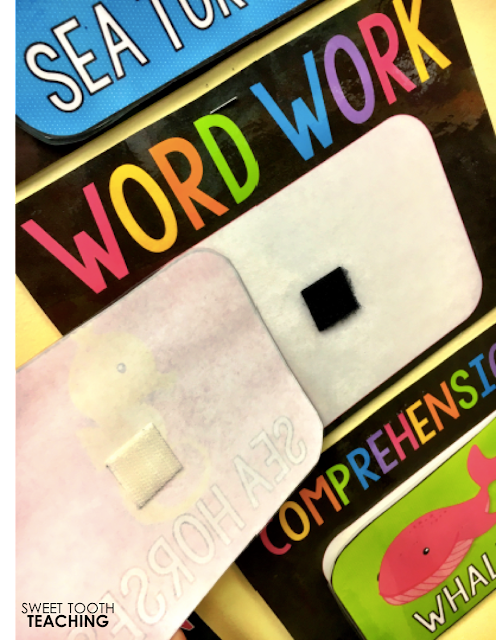 Word work center is usually the most engaging one! I try to include hands-on activities like this one. 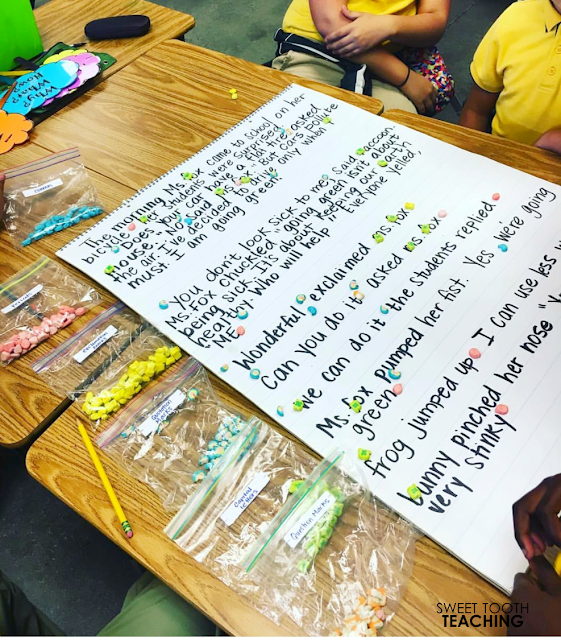 We used lucky charms as punctuation marks (each bag was labeled with the punctuation mark it represented) The kiddos had to read the passage together and decide which mark belonged at the end of each sentence. 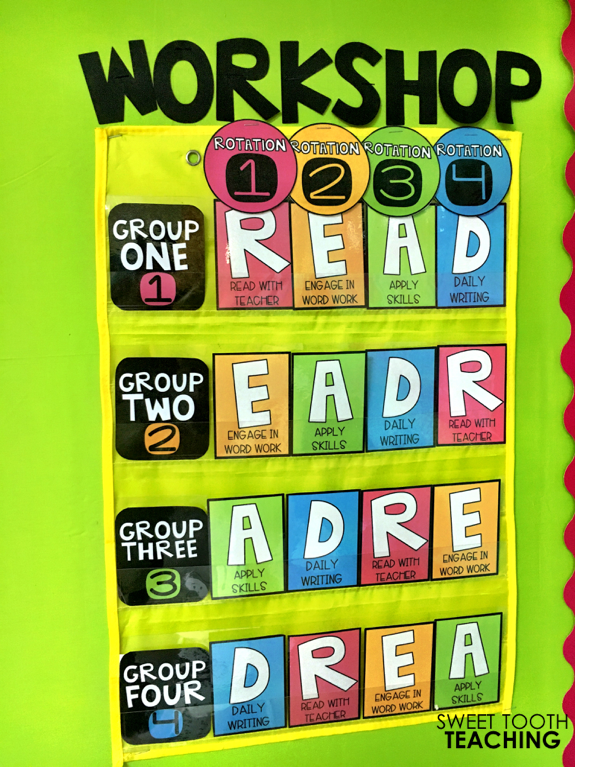 We also work on vocabulary, spelling, and grammar skills in our word work center. Our teacher-led center is where the true differentiation magic happens! Every group has a different activity based on their needs. In this case, this group needed some extra TLC with their text-based writing. We used the RACE strategy to identify the components of a paragraph. We also use leveled readers, work on debriefing cold read passages, and play comprehension games during teacher-led. I try to switch up the activities so the kiddos are always excited to come to see me. And that's about it! Literacy centers can seem a bit overwhelming at first, but I promise that once you get into the routine, it's a piece of cake! You'll see the most learning and growth when your kiddos are engaged in the proccess. If you are including clipart, fonts, or photographs in your products, you MUST purchase a license for commercial use. The majority of the clipart and fonts sold on TPT are for commercial use. Meaning, once you purchase these images/font you are allowed to use them in your products. Credit is not always required, however it is nice to include a credits page at the end of your product. 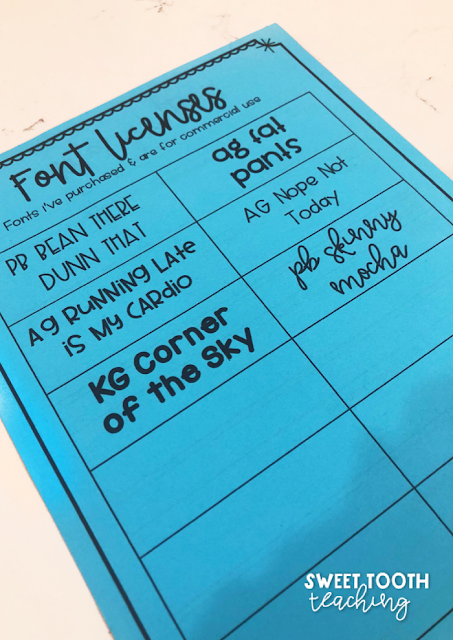 Once I purchase a font or clipart set, I like to make a note of it so that I know I have permission to use it. I've found that powerpoint is the easiest program to use when creating resources! It's very practical and allows you to drag images and text around. Adobe Acrobat allows you to secure your PDF files and ensure that all of the clipart is locked and cannot be stolen. I started creating resources for my students and it slowly turned into my creative outlet. 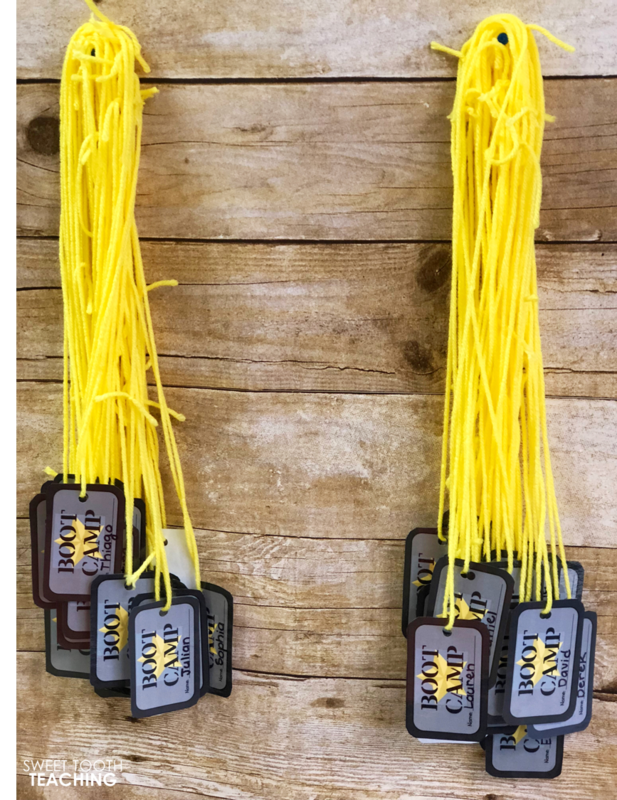 I created my first product in June of 2014 and did not make a sale until July of 2014. 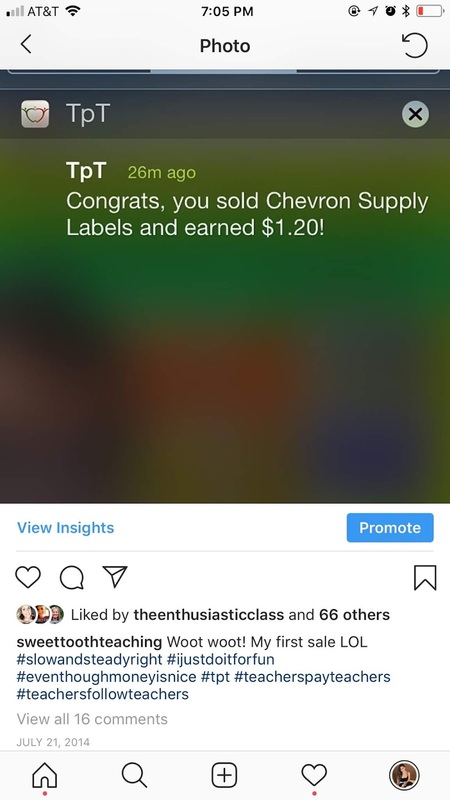 You guys, I was so excited about that $1.20. Now, I will tell you that creating resources can be time consuming. However, promotion and marketing are KEY in making sales. 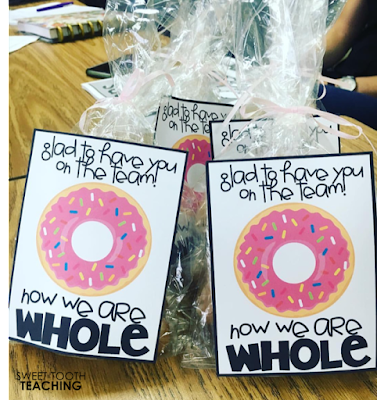 As soon as I opened up my store, I created my Instagram page @SweetToothTeaching which focused on all things educational. 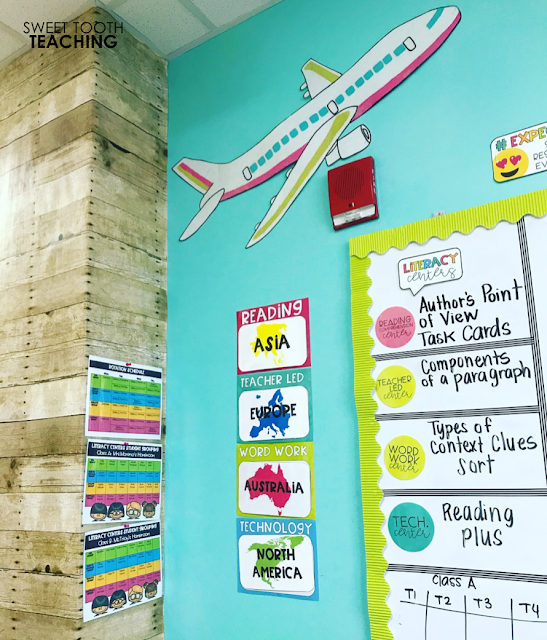 I took snapshots of activities in my classroom, organizational hacks, classroom decor, and glimpses of my products in action. Using hashtags, I searched for other teacher accounts and just started following as many as I could! Soon enough, I had also gained a handful of followers. 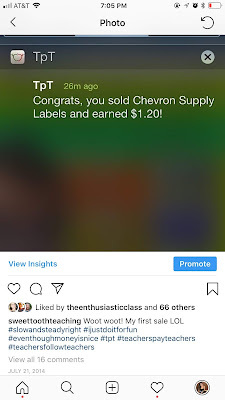 I started commenting on photos that inspired me and creating relationships with other teachers across this digital space. The online teacher community is honestly AMAZING and extremely helpful. Featuring my products on Instagram and Pinterest really helped me make sales over on TPT. 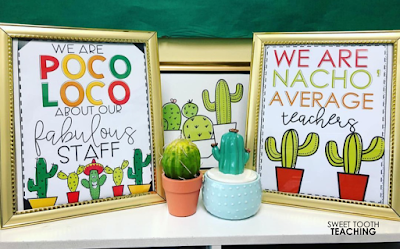 DO display your products in action in your classroom. DO follow accounts you feel passionate about and comment on photos that truly inspire you. DO join collaborative boards and pinning parties. You can find tons of seller forums on the TPT site. This is a great space for networking. DO be honest and REAL about your posts and content. This is what will truly lead you to gain an authentic following and eventually make sales. I try my very best to keep track of my products and constantly brainstorm new ideas. I also like to keep track of my monthly sales and monitor which products are selling the most. This will give me an idea as to what kind of resources to create next. 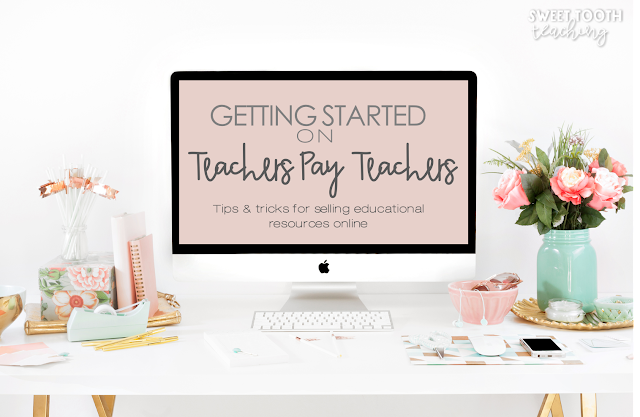 This year I am vowing to set aside at least one hour a week to checking emails and responding to questions on TPT. This is definitely my weak area and something I struggle with. I have created a handout for which includes product names and future updates. This will help me keep track of older products that might need some tweaking or additions requested by buyers. 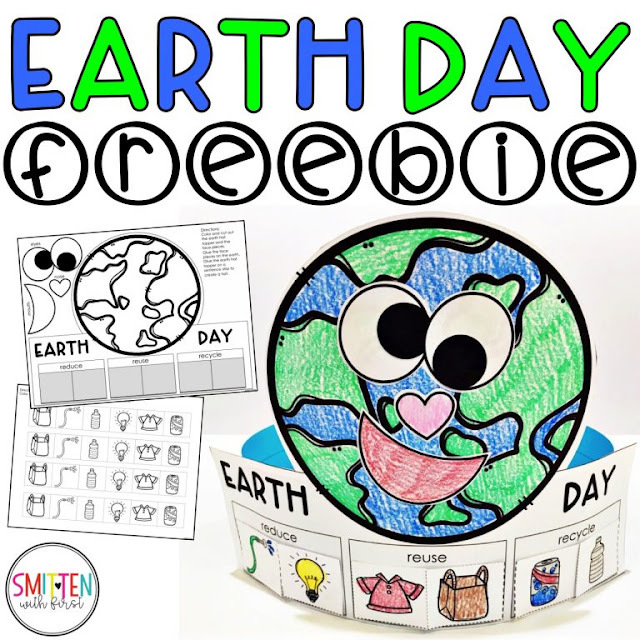 You can download these worksheets for FREE here! This is why I feel the need to constantly encourage my teacher friends to open up their own store. This business has taught me how to grow as a person and entrepreneur. It has forced me to step out of my comfort zone by reaching out to others and building relationships. Most of all, it has showed me the value of hard work and dedication. Like I said before, I am obviously not a TPT expert. 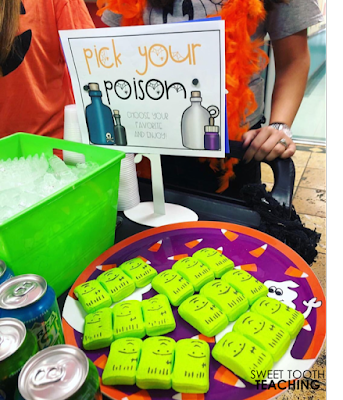 However, I absolutely LOVE sharing tips and tricks with teachers that are trying to get their store started. 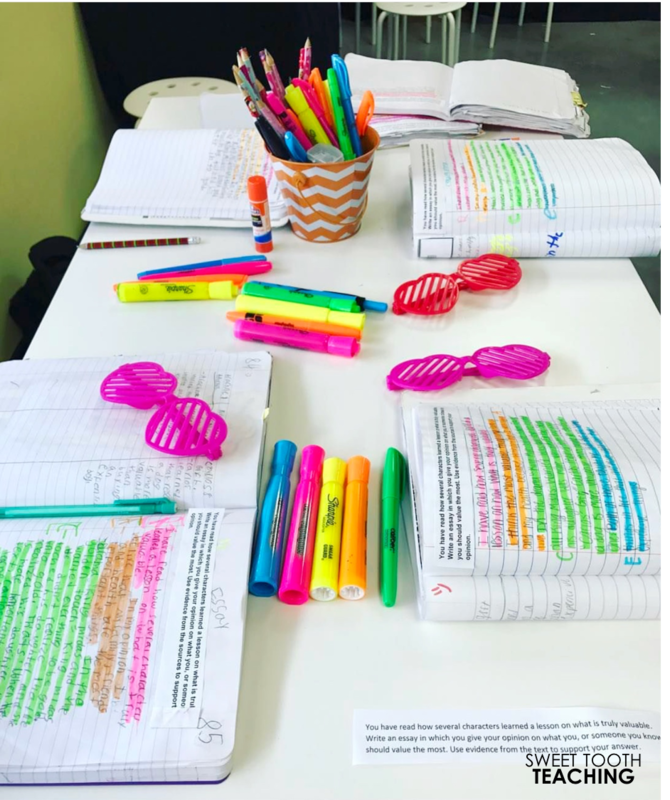 I have a tips & tricks highlight on my Instagram feed @SweetToothTeaching where I share Powerpoint tips for creating resources. If there is anything else you would like to learn more about, feel free to reach out and let me know!